Button for your thoughts? Custom Designed Dr Who Buttons... of course! I've been plugging away on my Custom Dr Who Tardis Slippers... (you can read more here: linky) and I finally have something fun to show! After an exhaustive search for buttons... I wasn't able to find what I wanted - one inch sized two or four hole buttons with some kind of Dr Who themed design or pattern. I looked at clay ones, and printed ones. I found a dalek or two, and a couple of tardis ones, but nothing in the size and level of simplicity required for this project. 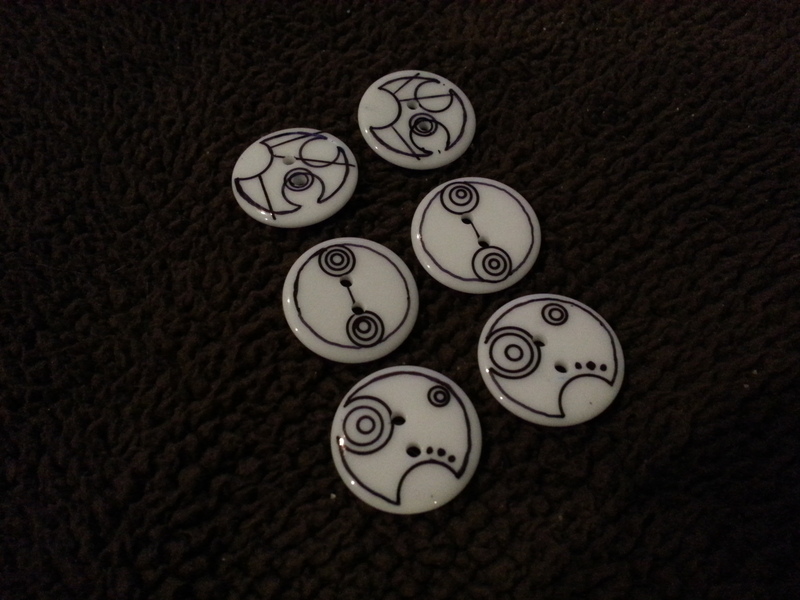 Then I started looking for a Gallifreyan translator... bought some one inch white resin buttons and a trusty permanent fine point marker... and started playing with my idea. Here are the finished buttons! I think they look fantastic... and I love that the design actually represents words that are meaningful for my Client!